How did Holocaust survivors discuss those events with their children? How Did Survivors Discuss the Holocaust With Their Children? 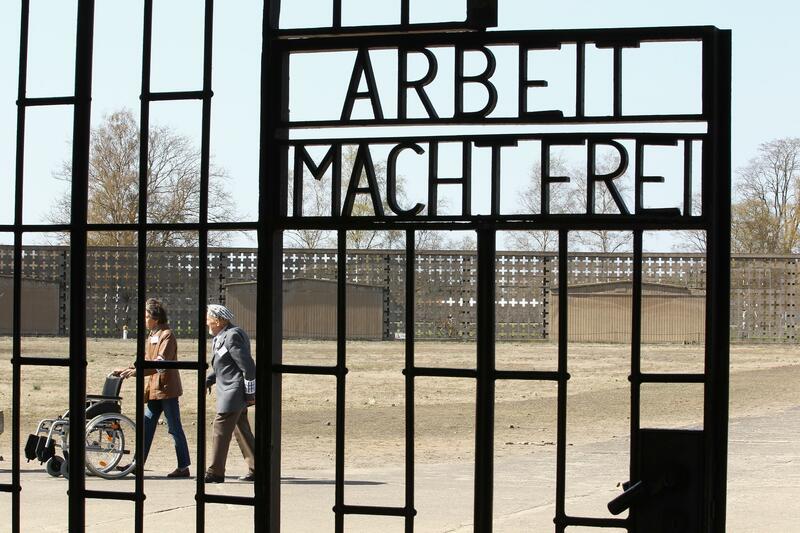 A Holocaust survivor and his daugther walk behind the entrance gate with the inscription “Arbeit Macht Frei” during their visit to the former concentration camp Sachsenhausen in 2010 in Oranienburg, Germany. I responded differently because of my own experiences with my parents. When I was maybe 8 or 9 years old and I asked my parents about Hitler, my parents kept telling me, “Everything will be OK. Not to worry. As long as you say your prayers, God is going to help us, and everything will be OK.” I desperately wanted to believe that. But I could sense that our situation was going from bad to worse. When I asked why Hitler wanted to kill all the Jews (because Hitler was on the radio, always yelling), they told me, “Don’t worry. The Germans will not come to our tiny village in Transylvania, Romania.” I believe my parents didn’t really know what would happen, and they hoped they would escape it. But they didn’t really know. I wish they would have just told me that. But by treating me like a child, not grown-up enough to get an answer to my question, I felt cheated. That was belittling. I decided when I had children I would always tell them the truth at their own level. For example, our son Alex was a very cute kid, and he was invited to many birthday parties. He was about 3 years old, and at all these birthday parties there were grandmas, grandpas, aunts, uncles, and cousins. But when he had a birthday party, there was no grandma or grandpa. And he said to me, “Mommy, Lee Ann has a grandma. Joey has a grandma. Eric has one. Why don’t I have one? What happened to my grandma?” I sat him down and told him both his father and I were taken to concentration camps by bad people called the Nazis. They killed his grandparents. For him at age 3, that was an answer that was honest but not overly traumatizing. When later on I talked to friends who brought my husband to the United States, they said, “Well, we would be honored to be their make-believe grandparents.” So at least my children felt that they had some grandparents, even though they were not biological. They were very nice people who bought them toys for their birthdays, took them out for ice cream, and things like that. I answered honestly but didn’t give her more than she could handle. Children are honest and not afraid of the facts of life—they can face them. Let’s just look at the other case. What would happen if I had said, “Don’t you ever ask me that question.” What do I do to the child in that case? Or, “Don’t bother me with that question. I don’t want to answer.” Now we are developing something in the child that there is something so wrong you can’t even talk about it, instead of answering her natural curiosity with a truthful answer. That is the way I live my life. I always tell the truth, maybe too much brutal honesty, but I never have to worry about what I said—the truth is always there. When you are raising children who are second-generation Holocaust survivors, they need to know what happened. But at a young age, they only need very simple, factual answers. I don’t think I have ever given any children nightmares from what I survived, but I have heard of other second-generation children whose parents gave them nightmares. Because they wouldn’t talk about that deep dark mystery, it took on a life of its own in their imaginations. Why hide something that is part of who you are, and an important part of who you are, just because you don’t want to deal with it? The truth will always set you free, and it will never ever harm anyone if it’s done in a caring way and with some wisdom. So that is what I learned from my life, because I surely wish that my parents didn’t try to protect me so much from the facts. They obviously could not. I’m sure they did it out of goodwill—they wanted to protect us. But if a child in any situation asks a question, please answer it truthfully, honestly, and at his or her own level. Children deserve the respect to have a well-thought-out but truthful answer. The Holocaust: Should Holocaust survivors forgive the Nazis? The Holocaust: What was it like to be part of the genetic experiments on twins during the Holocaust?